Oil on canvas, 31 x 27 cm. 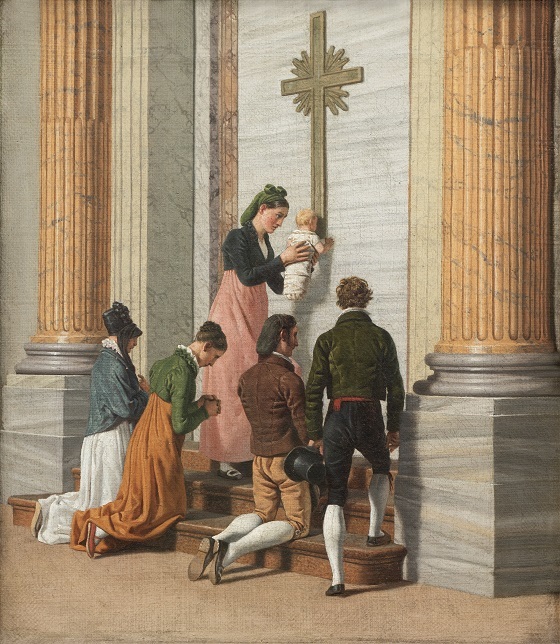 This is a little scene that Eckersberg likely observed at one point during his time in Rome. It depicts a family ritual, where a godmother holds a small newborn in swaddling clothes up to the cross on the sealed Holy Door to St. Peter’s Basilica. The door is ceremoniously opened during special anniversary years, which until the 20th century was held every 25 years. It is a momentary scene, yet re-enacted by thousands of other Roman families again and again. The work is a cross between an architectural study with staffage and a genre painting of contemporary life in Rome. Eckersberg’s sober approach to the subject and composition is clear, however. The staffages appear in sculptural poses on equal footing with the architecture, and together they form a number of dynamic lines and diagonals in the holy space. This lends the painting a somewhat static character; a scene removed from time and space.